This is Computer Science engineering project on "online voting /polling system", which focus on solving issue in voting like ridging votes during election, insecure or inaccessible polling stations, inadequate polling materials and also inexperienced personnel. With this system, the voters or citizens shall be given good amount of time during the voting period. They shall also be trained on how to vote online before the election time. You can also Subscribe to FINAL YEAR PROJECT'S by Email for more such projects and seminar. In “Online Voting / Polling System” a voter can use his\her voting right online without any difficulty. First of all voter has to be registered in the system to vote. Registration is mainly done by the system admin for security reasons. The system Administrator registers the voters on a special site of the system visited by him only by simply filling a registration form to register voter. Citizens seeking registration are expected to contact the system admin to submit their details. After the validity of them being citizens of country has been confirmed by the system administrator by comparing their details submitted with those in existing databases such as those as the registrar of persons, the citizen is then registered by the Election governing body as a voter. After registration, the voter is assigned a secret username and password with which he/she can use to log into the system and enjoy services provided by the system such as voting, checking results among others. If invalid/wrong details are submitted, then the citizen is not registered to vote. 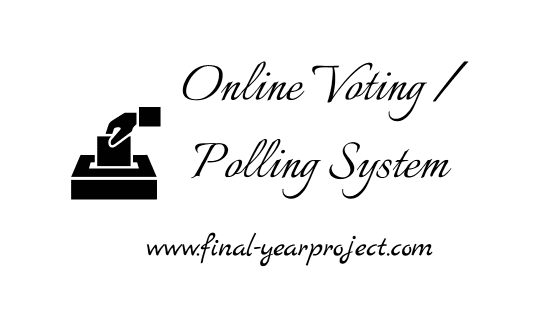 This project on the Online Voting System (OVS) focuses only on the voting phase. Electronic voting using the OVS should be cheaper than the present paper based arrangement of some countries. The phenomenal use of the Internet as a vehicle for improving communication, access to information and electronic commerce has led to the claim that the Internet could be used as either a replacement to attendance voting or as an additional voting option. Use this project report for your reference only. Thanks to the author of this project. Do let us know in comments and Facebook, the scopes of improvement of this project. Right we only have its project report and no source code.